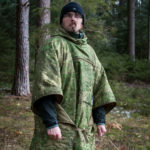 This time I would like to write about the Helikon Tex Gunfighter Softshell, which was kindly provided to me by Hwesta.eu. 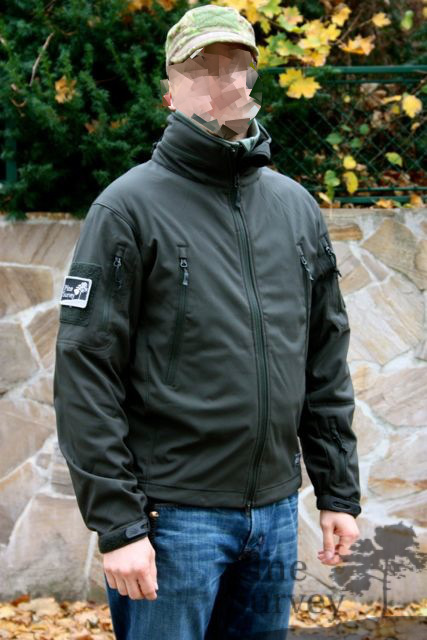 This particular design of the jacket is available from different manufactures and features the same cut and some of the features of the original TAD Gear jacket which was the antetype. Although one has to be fair enough and admit that there are some changes in design and also new elements, which were incorporated into the design by Helikon Tex. 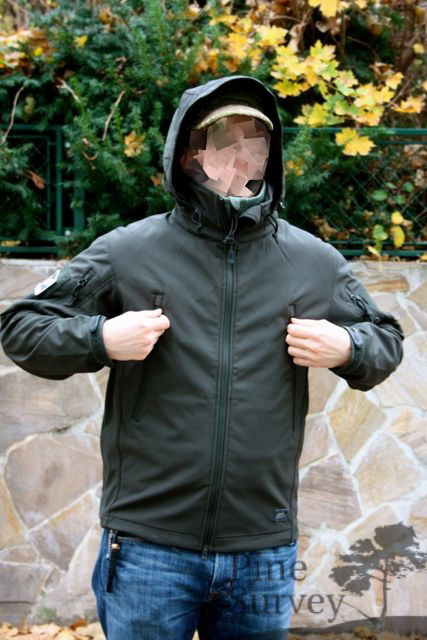 Regarding to the catalogue, the jacket is designed as a light protection against rain,wind, cold and dirt for the LE/MIL sector. 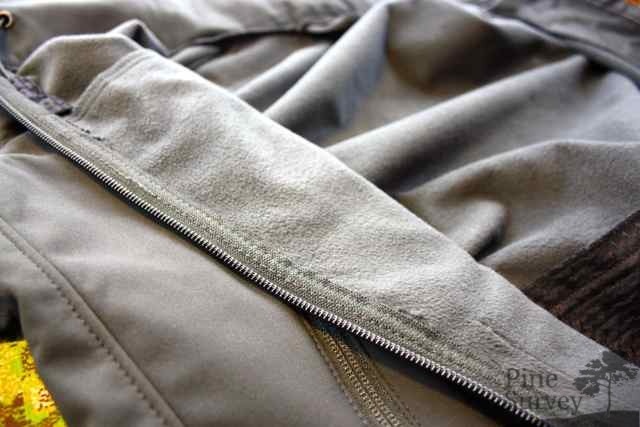 The outer layer is a 4-way elastic Sharkskin softshell material made out of 100% polyester. 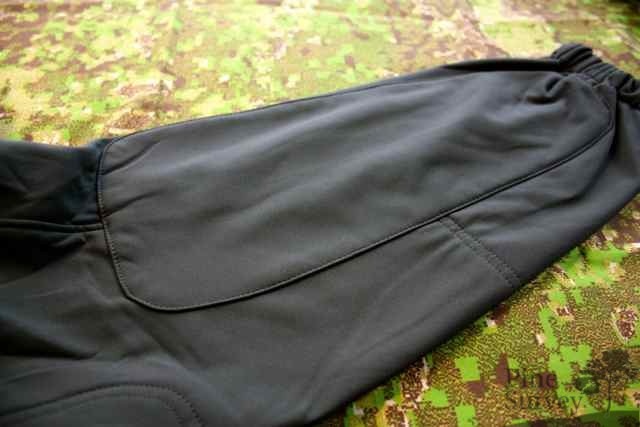 The midlayer is a breathable film membrane and the inner layer a super fine fleece material for insulation. The surface of the shell is treated with DuPont’s Teflon fabric protector to help protect the material from dirt. The combination of these materials should be able to resist a water column of 10.000 mm and allow a breathability of 8000g/m2 over a period 24h. 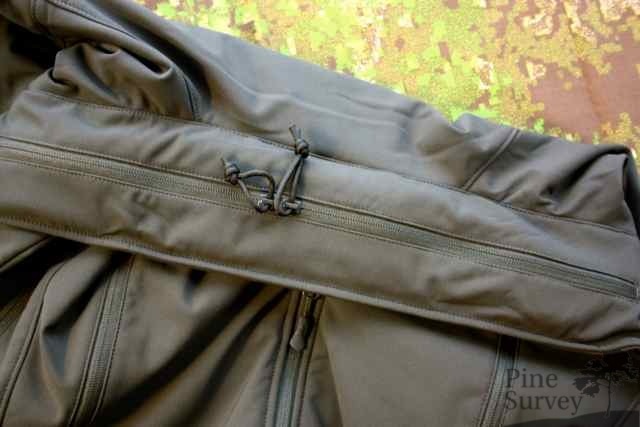 The zippers are made by YKK and feature zipper pulls with paracord or ergonomically formed plastic pulls. 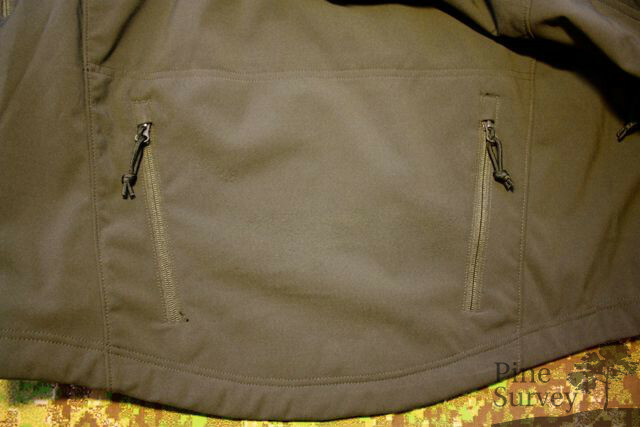 The color of the jacket shown here is Helikon’s “Jungle Green”. This is a very dark OD green, which can appear also like anthrazit or grey, depending on the light and individual perception of colors. Of course one has to take the material into account, which tends to absorb the dye differently depending on the fabric. To give you an example, my Helikon Trooper jacket (which is made out of another fabric) is also jungle green but differs slightly in color as the Gunfighter. 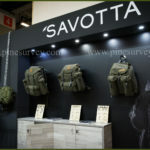 The jacket is also available in OD green, Coyote/tan, Foliage green, Camogrom, MP camo (british MTP), black and navy blue. The hood can be stored away in the collar and can be adjusted via two shock cords. 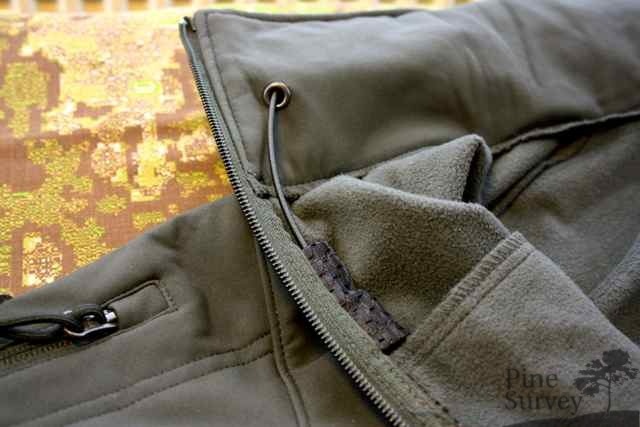 One of the cords is channeled to the chest pocket and can be used to adjust the opening of the hood. 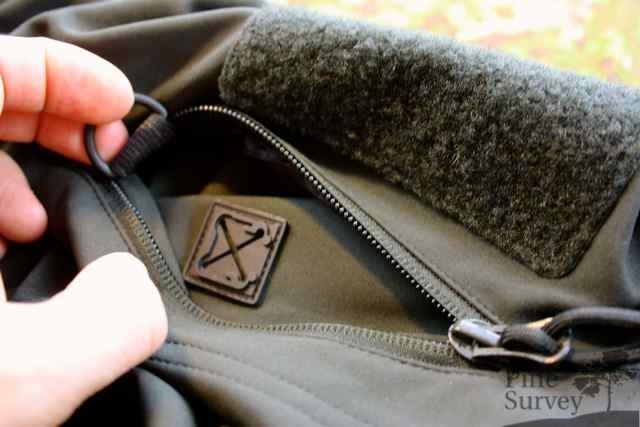 You can tighten the hood while keeping your hands in the pockets. This might seem odd but it has the advantage of no laces dangling around. The second cord is at the back of the hood to adjust the tightness of the hood. That way you can improve the movement of the hood while moving your head. 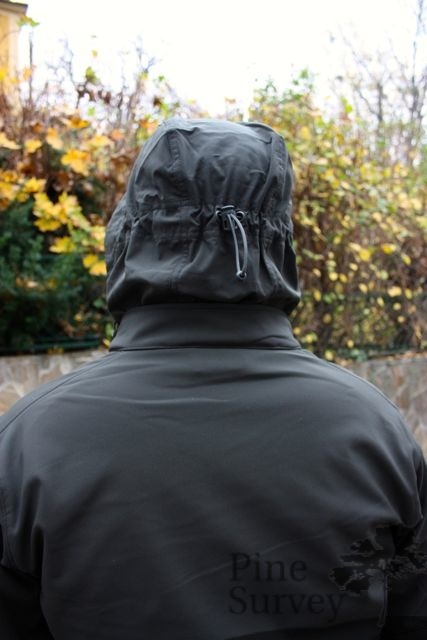 If you decide to wear the jacket with the hood outside of the collar, you will find the possibility to close the opening of the hood with a small velcro tap thus bringing the hood to your back. That way there is kind of a prevention of collecting dirt and stuff if you have to crawl underneath obstacles. When stored away in the collar, it does not become bulky or stiff and is still comfortable to wear. 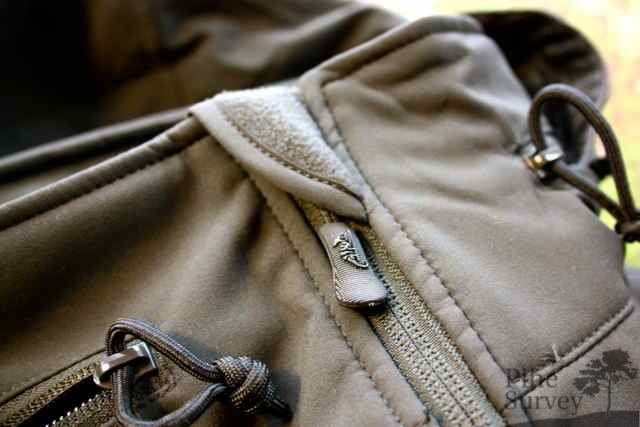 The zipper that closes the compartment for the hood is equipped with two slides which provides access from both sides. One disadvantage is the attachment of the hood inside of the collar. If you are wearing the hood outside on your head there is a fold which could collect water or debris. The chest pockets feature the same setup left and right. 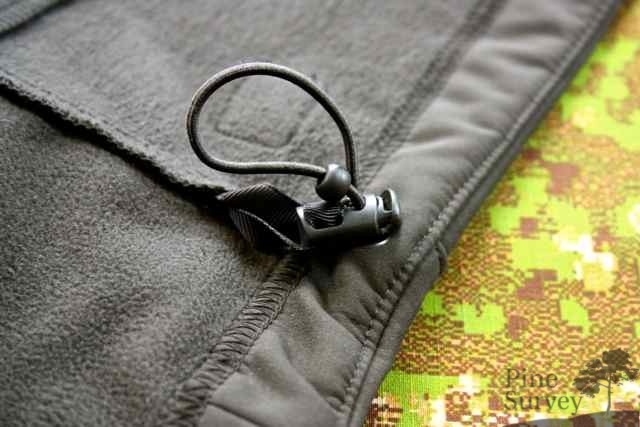 Both have got a small slip pocket, which is four fingers wide, a D-ring on an elastic strap as well as a eyelet for cables, which can be channeled into the interior of the jacket. 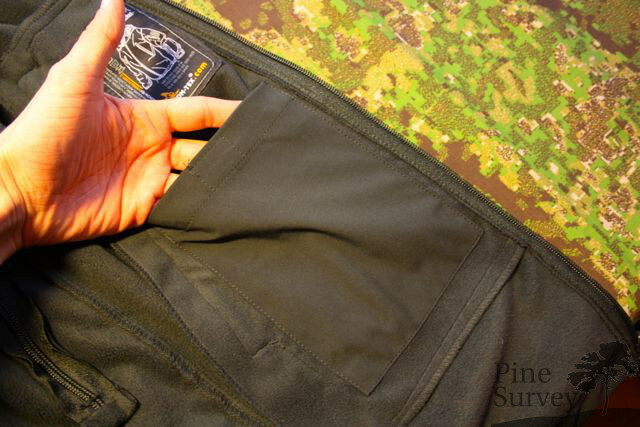 The upper arm pockets also feature the same configuration on the left and right side. A D-ring on an elastic strap and a eyelet for cables. 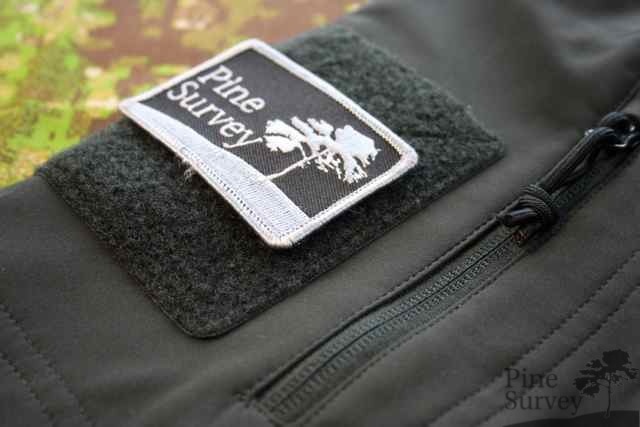 On the outside there is a velcro panel for patches and insignia. As mentioned before there is a small pocket at the left forearm. In it there are no features. Worth mentioning though is the fact that the inside is not made out of softshell but a light mesh material. How long this material is going to last is hard to tell. Since the pocket can only be used for small stuff there should be no problem though. 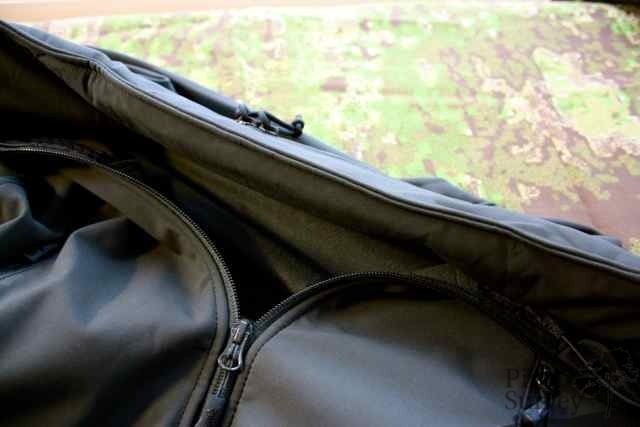 It could only get annoying, if you want to store something with a velcro backing inside this pocket. 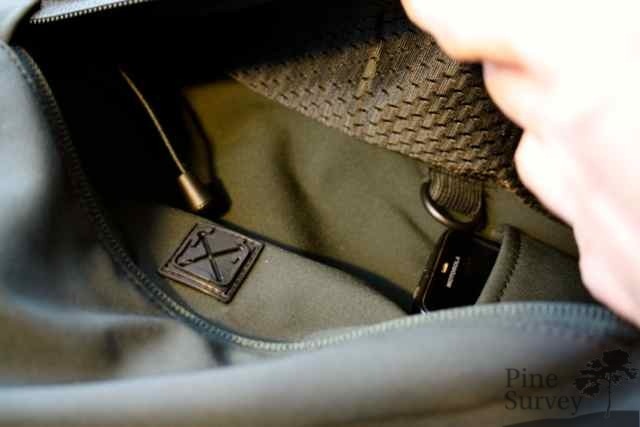 On the left side at chest height you will find another pocket inside of the jacket – a much welcome feature you don’t find that often with softshells. There is enough room for a wallet and the opening can be closed with a small velcro tab. 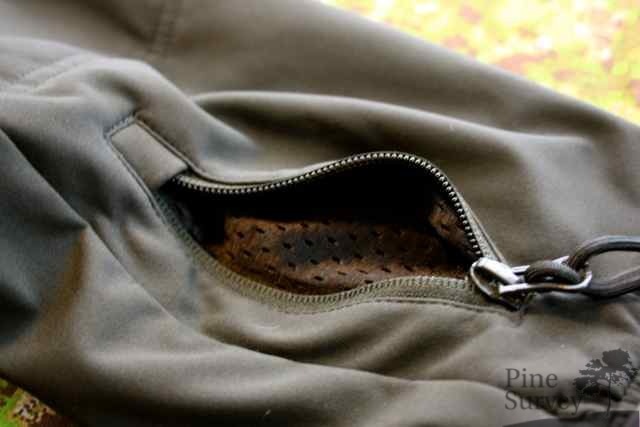 At the bottom back of the jacket you will find a poachers pocket which can be accessed from the left and right through zippers. 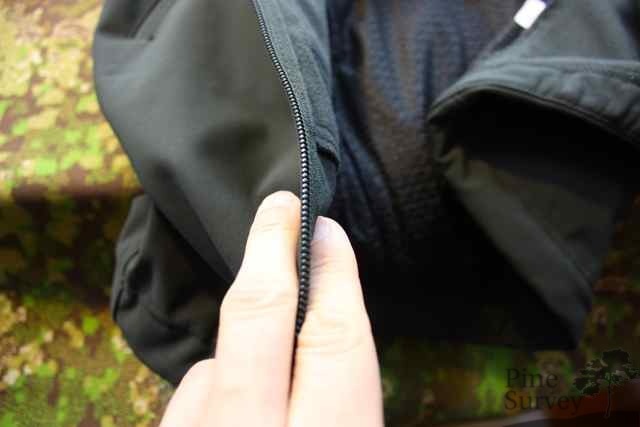 There are no internal features and just like the pocket at the forearm, there is mesh material to the inside of the jacket. 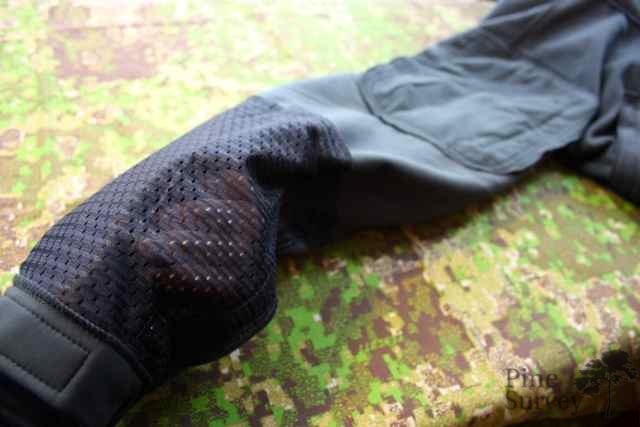 The elbows of the sleeves are reinforced with another layer of Sharkskin softshell material. The wristbands feature an elastic band and a velcro adjustment. 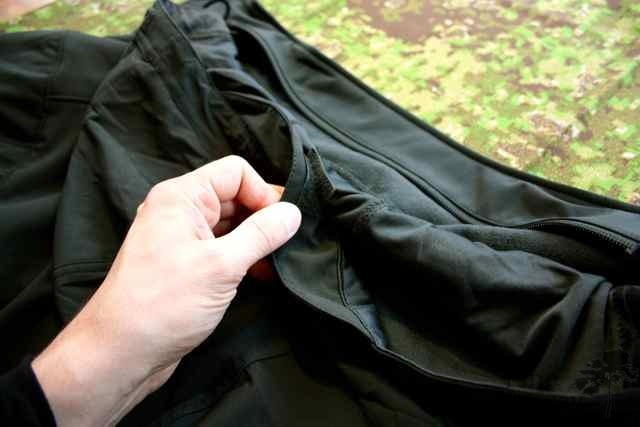 In the area of the armpits you can find pit zips to allow better ventilation if it gets warmer and you don’t want to take the jacket of, or simply can’t. 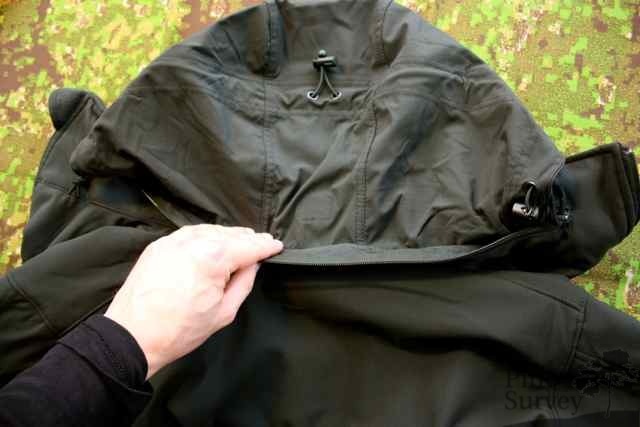 The bottom of the jacket can be individually adjusted with shock cord. This can be secured with cord locks. The YKK zipper at the front has two slides that work flawless and easy. 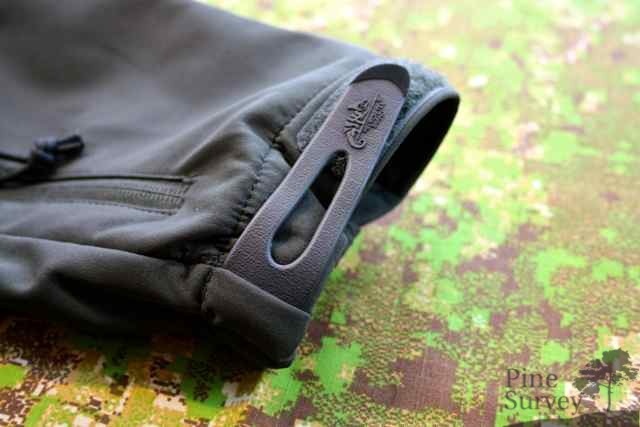 The bottom slide can also be used to open the jacket from below, if you need to access gear underneath the jacket. At the top of the zipper there is a chin guard to prevent pinching of any kind. The jacket was delivered to me in a top notch condition. All of the seams are neat and I was unable to find a single workmanship failure or a loose thread. The feel is heavy and high grade. Helikon did its homework. 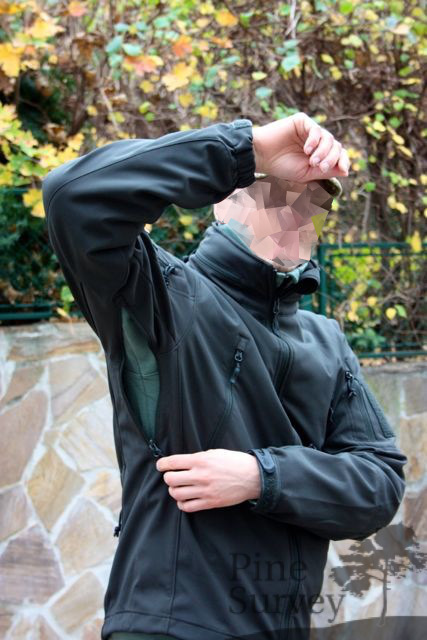 The jacket has an athletic fit and as usual with softshells. At the same time you know that an american design acted as a model. At a personal height of 1,80m and ca 75 kg the size Medium fits perfectly for me. And there is enough room for an additional layer. The length of the sleeves is long enough – fortunately. I am saying this because the lighter shell – named “Trooper” – has clearly shorter sleeves in spite of the same size, which pissed me off a little bit in summer. Just in time for the change in weather the jacket arrived and was used immediately for different occasions. As of now I wore the jacket in temperatures between 0°C and 15°C. The performance was very satisfactory and it also proved itself in light rains. The water was rolling off the face material and did not penetrate the shell. It is safe to say that the aim for protection against wind and light rain was successfully achieved with this jacket. What puzzled me at first was the breathability. 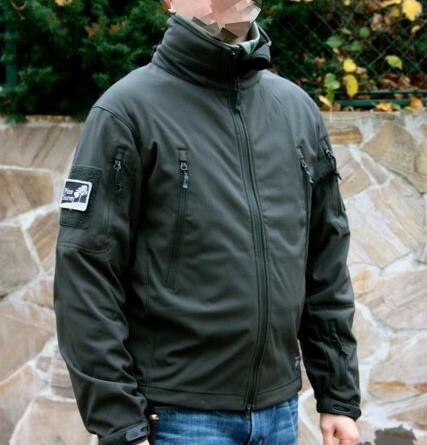 At first it was not satisfactory at all but improved with the increased wearing of the jacket. I have no clue if this is a cause of the DuPont fabric protector or another treatment of the material. By now I don’t have any problems anymore and the jacket “breathes” normally since broken in. Other remarks would concern the easiness to clean and aerate the jacket. 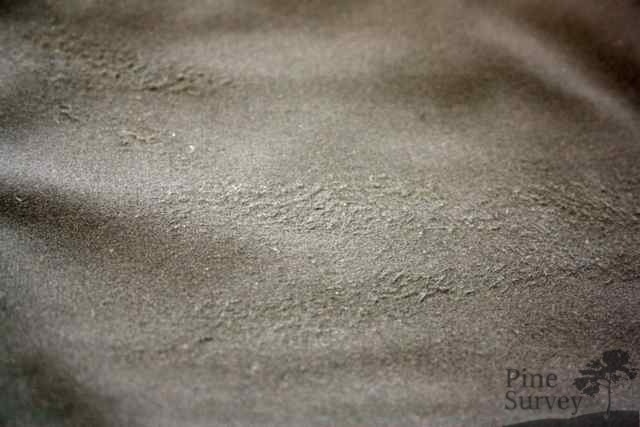 Dirt can be wiped down easily using a wet cloth and potential odors don’t get that easy into the jacket or vanish after hanging the jacket outside for a night. The Gunfighter can be machine washed at 40°C but should be treated with a dedicated softshell impregnation afterwards. I am curious about the longevity of the sharkskin material. At the back there are some signs of wear after one month of use. Time will tell if this is a problem or just a normal effect of use. After all this is sharkskin softshell material and not rhinohide. Helikon Tex went through a constant upswing in terms of quality. The gunfighter softshell jacket is a wonderful example for this. Although available for quite some time now, there were constant improvements. The softshell is ideal for the autumnal temperatures and weather conditions and can be easily be worn even in winter with the right layers underneath (after all the perception of cold is different from person to person). 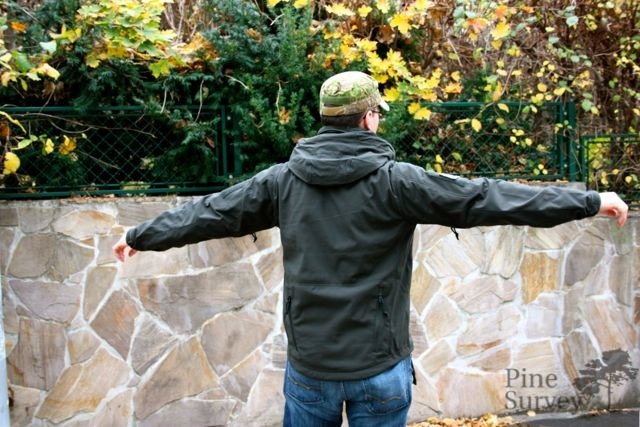 The price for this jacket is competitive like most of Helikon’s products, and with 95€ to 105€ (depending on color and camouflage pattern) it is worth a look, if you are looking for a medium priced softshell. At this point I would like to thank you for your patience and reading. 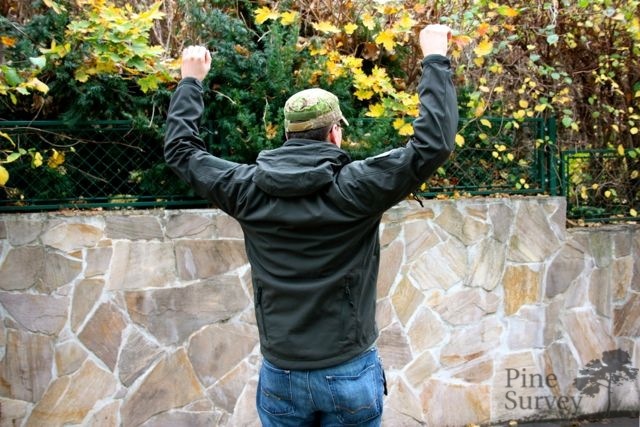 I hope I was able to give you a better insight into this jacket despite existing reviews. Special thanks go to HWESTA.EU who made it possible to make this review. Check them out! Thanks to J. for her help taking the pictures.